Do you remember a time when your sales team didn’t bump heads with Marketing? We didn’t think so. Whether over strategy or not enough qualified leads, there has always been some degree of disagreement between the two. But managers rejoice, the decade long battle might finally be coming to an end. Sales and Marketing might have finally found the key to working together—inbound selling. What exactly is inbound selling? Traditionally, both Sales and Marketing have used outbound methods to find prospects and target them with their message. Or should we say bombard them with their message? The majority of the time this “message” was all about the product or service they were selling. It was rarely about actually listening to what a prospect’s problem was and determining if their solution was the right fit. Outbound methods are ineffective and outdated. Buyers are more knowledgeable today than ever before because they have so much information available to them. If a buyer identifies their problem, it takes mere seconds to find a solution online. And because of this, getting Sales and Marketing to sell together is more important than ever. Here’s where inbound selling comes in. Sales enables Marketing and Marketing enables Sales to achieve inbound selling. Both teams have the tools needed to meet revenue goals, they just have to bring them together and start using them to sell together. The sales process starts well before a prospect is even discovered. It starts with the marketing and sales methods that qualify the right prospects. Inbound selling weeds out only the best prospects to move to the next step in the sales funnel. In outbound selling, the top of the funnel might be filled with hundreds of leads, but these leads were found through outbound methods like purchasing lists or sending mass SPAM emails. So how qualified can they be? Inbound selling generates inbound leads through strategic, data-driven marketing efforts. With their automation software, Marketing is armed with all of the essential data needed to target the right prospects. Content marketing, for example, is one of Marketing’s most powerful tools. Through production of blogs, white papers, case studies, eBooks, social media posts, and email campaigns, Marketing puts the right content in front of the right prospect to engage them and convert them to a lead. Let’s say that through Marketing’s content marketing efforts, 1,000 inbound leads are generated. That might not mean that all 1,000 leads are qualified. Maybe only 200 of these inbound leads are qualified. We call these leads Marketing Qualified Leads. These are the leads that Marketing has qualified and are ready to pass on to Sales. Then it’s Sales job to determine which of the 200 leads are Sales Qualified Leads, or the leads that have fallen into a meaningful level of engagement. Providing Sales with 200 of the most qualified inbound leads makes Marketing look like a champion. Sales can only do so much on their own. There just isn’t enough time in the day to spend hours prospecting for the right leads. Inbound selling enables Sales to lean on Marketing for some of the heavy lifting. Marketing is the brains of inbound prospecting. They are equipped with analytics that show not only pertinent prospect information like where they work, their title, email, etc., they have access to data that shows the context with which they became a lead. Using marketing automation software, Marketing has to ability to determine how their inbound leads came in and what made them convert. For example, a prospect that downloaded a recent eBook is entered in as a lead and is assigned to a sales rep based on criteria they filled out in a form. This form has strategic questions that aim to identify and qualify leads. With this information, Sales sees what made their prospect convert and can work with Marketing to determine why. Through marketing automation software, Marketing and Sales can closely monitor a lead’s engagement with their prospecting efforts. Insights tracked in the software allow Sales and Marketing to better align their strategies and move leads further through the sales funnel. If a prospect downloaded the eBook “How To Use Practice Management Software To Be More Efficient,” it is safe to assume they are in the top to middle funnel. On the flip side, if they downloaded a case study about practice management software ABC and how it worked to increase efficiency in 3 busy practices, they are more likely in the bottom of the funnel and are closer to a sales-ready discussion. When leads come in, it’s essential to engage with them right away. But it’s not enough to just call them and hound them with emails. Emails need to be targeted, informative, and worth your prospect’s time. This is another inbound selling method in which Sales leans on Marketing. Sales reps that practice the “Always Be Helping” methodology understand how inbound selling works. Your prospects view you as just another sales rep. Why do they even need a sales rep when they can research and find solutions and make purchases online? It has become the sales rep’s job to position himself as a trusted advisor and expert in their prospect’s industry. This is the only way prospects will award you with their business. So how do reps achieve this? They reach out to Marketing for help. Marketing, as we mentioned before, is armed with content marketing materials that are meant to educate, inform, and engage with prospects. 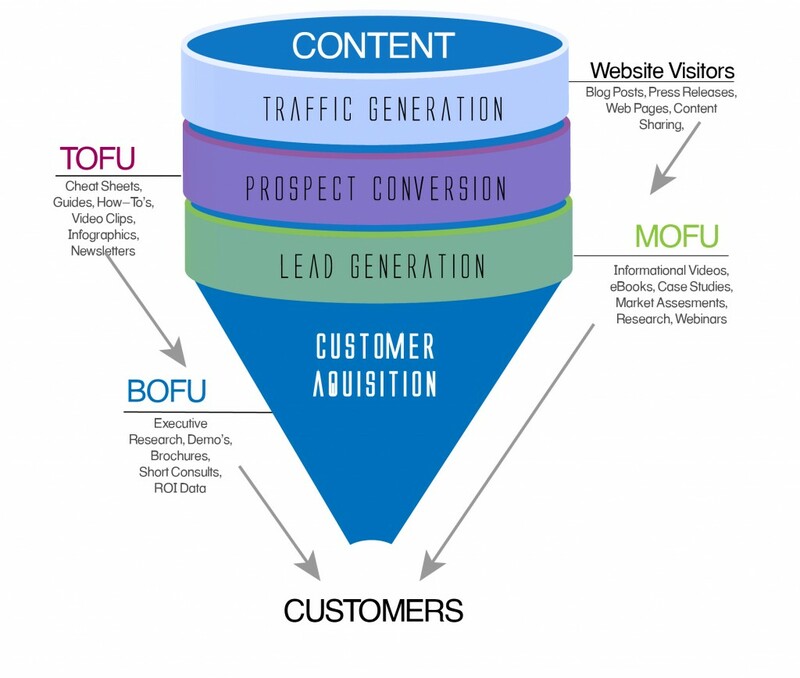 There are different content types for each stage of the buyer’s journey (see diagram below). Sales has to have a deep understanding of these different content marketing pieces and in what situations they should use them. For a prospect that is just researching their problem, it wouldn’t be effective to present them with a case study. Instead, send them a friendly email with an eBook that describes a broad theme in their industry. For example, an eBook on “The State of Patient Payments,” or “The Future of Healthcare Technology Platforms”. These topics are meant to inform and educate, not sell. The selling part only comes once a prospect has developed a meaningful level of engagement with a sales rep.
For inbound selling to work, Sales and Marketing have to speak the same language. Both teams need to understand the role that each plays in finding, engaging, and converting prospects into leads. Learn more about how inbound selling is achieved through the alignment between Sales and Marketing. Download the eBook on “Smarketing” below.